I need to get rid of the pack of ground beef in the freezer. What should I make? Meatloaf, of course! I have several sad looking celery sticks sitting in the fridge, so I chopped them up and threw them in too. The first time I made a meatloaf, I followed a recipe I found on the internet and measured everything precisely. But now? I simply throw in whatever feels right. 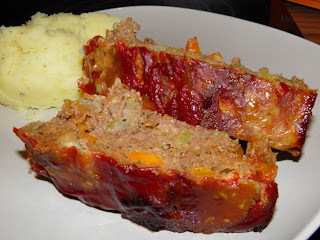 And the meatloaf tasted pretty juicy and yummy. The joy of cooking! 2. Heat some olive oil in a pan and cook the onion, celery, carrots, and garlic for about 5 minutes. 3. In a large bowl, mix the cooked vegetables and the rest of the ingredients together. Put into a loaf pan and cover the loaf with a thick layer of ketchup. Cook in the oven for an hour.